Six promotional featurettes for Meryl’s films, including Postcards from the Edge, The River Wild, Lemony Snicket’s A Series of Unfortunate Events, Prime, Doubt and Suffragette have been added to the video archive (the Suffragette video has been added before but went without mention). The former five are not full featurettes but rather bits from an entertainment program, still a great find and some wonderful on-set footage and old interviews. Click any of the previews below. Congratulations to Meryl Streep for winning her career’s 15th Oscar nomination. She was nominated as Best Actress for “Doubt”, alongside fellow nominees Anne Hathaway (Rachel Getting Maried), Angelina Jolie (Changeling), Melissa Leo (Frozen River) and Kate Winslet (The Reader). Philip Seymour Hoffman received a Best Supporting Actor nomination while Viola Davis and Amy Adams were nominated for their supporting performances in “Doubt”. The film received a fifth nomination for Best Adapted Screenplay. The Oscars will be presented on February 22 from Hollywood’s Kodak Theatre. The broadcast will air on ABC. Hugh Jackman is scheduled to host. A full list of nominations can be found on Oscar.com. Meryl has been nominated as Best Actress for “Doubt” for a BAFTA Award. She shares this category with Angelina Jolie (Changeling), Kristin Scott Thomas (I’ve Loved You So Long) and Kate Winslet being double nominated (Revelutionary Road and The Reader). Congratulations also to Philip Seymor Hoffman for nabbing a Best Supporting Actor nomination and Amy Adams for receiving a Best Supporting Actress nod. “Mamma Mia” was able to score some nominations as well in the categories of Best Music (Benny Andersson and Björn Ulvaeus) and Outstanding British Film. Producer Judy Cramer is nominated for the Carl Foreman Award for Special Achievement by a British Director, Writer or Producer for their First Feature Film. The BAFTA Awards will be handed out on February 08, 2009. Meryl has won yet another Best Actress award for “Doubt”, this time a Critics Choice Award. The voting for Best Actress resulted in a tie between Meryl and Anne Hathaway for “Rachel Getting Married”. While Anne Hathaway was present to accept her award, Meryl was not. Her award was accepted by “Doubt” co-star Viola Davis on her behalf. 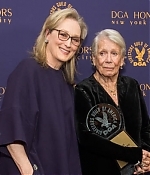 With the awards season being in full bloom, speaking of the Film Critics awards, Meryl was chosen by both the Phoenix Film Critics Association and the Washington Film Critics Association as Best Actress for “Doubt” – and is further nominated in this category by the London Film Critics as well. Congratulations to Meryl for receiving a Screen Actors Guild Award nomination as Best Actress for “Doubt” – and a second nod as part of the ensemble in the Best Ensemble category. All four members of the “Doubt” cast have received individual nominations, Philip Seymour Hoffman as Best Supporting Actor and Amy Adams and Viola Davis as Best Supporting Actresses, making “Doubt” the leading picture with 5 nominations! The SAG Awards will be handed out during a live broadcast on January 25, 2009. Congratulations to Meryl Streep for receiving not one but two nominations for the Golden Globe. She’s nominated as Best Actress in a Drama for “Doubt”, alongside Anne Hathaway (Rachel Getting Married), Angelina Jolie (Changeling), Kristin Scott Thomas (I’ve Loved You So Long) and Kate Winslet (Revolutionary Road) – and as Best Actress in a Comedy or Musical for “Mamma Mia”, alongside Rebecca Hall (Vicky Christina Barcelona), Sally Hawkins (Happy-Go-Lucky), Frances McDormand (Burn After Reading) and Emma Thompson (Last Chance Harvey). Meryl’s two films are prominently featured at this year’s Golden Globes with “Doubt” receiving a total of 5 nominations for Best Actress, Best Supporting Actress (Amy Adams and Viola Davis), Best Supporting Actor (Philip Seymor Hoffman) and Best Screenplay (John Patrick Shanley) – and “Mamma Mia” with 2 nominations for Best Picture Muscial/Comedy and Best Actress. The Golden Globes will be handed out in a ceremony on January 11, 2009. With the announcement of the 66th Annual Golden Globe Award nominations and Meryl receiving not one but two nominations, the actress surpassed Jack Lemmon’s count of 22 nominations and is now, besides holding the record for most Oscar nominations, the actor with the most Golden Globe nominations of all time with a total of 23 nominations. Meryl Streep has received a Critics Choice Award nomination as Best Actress for “Doubt”. The film was able to score five more nominations for Best Picture, Best Supporting Actor (Philip Seymor Hoffman), Best Supporting Actress (Viola Davis), Best Ensemble and Best Writer. Winners will be revealed at the 14th annual Critics’ Choice Awards ceremony on January 8, 2009 at the Santa Monica Civic Auditorium, broadcast live on VH1 Television Network.